Consider this: Saskatchewan is 651,900 km² (251,700 sq mi), that is almost twice as big as Germany with 357,021 km² (137,847 sq mi). So, are we talking local as in province local? Or is local more of a city local? The Canadian Food Experience Project began June 7 2013. As over 80 participants across Canada share collective stories through regional food experiences, we hope to bring global clarity to our Canadian culinary identity. Finding out how local “local” is in Canada is one part of this project. I think my pick is more of a provincial local than a city local. When I first heard of Saskatoon berries I thought they only pretty much grew around Saskatoon. It took a good long while until I learned that Saskatoon the city is named after the berry, not vice versa. 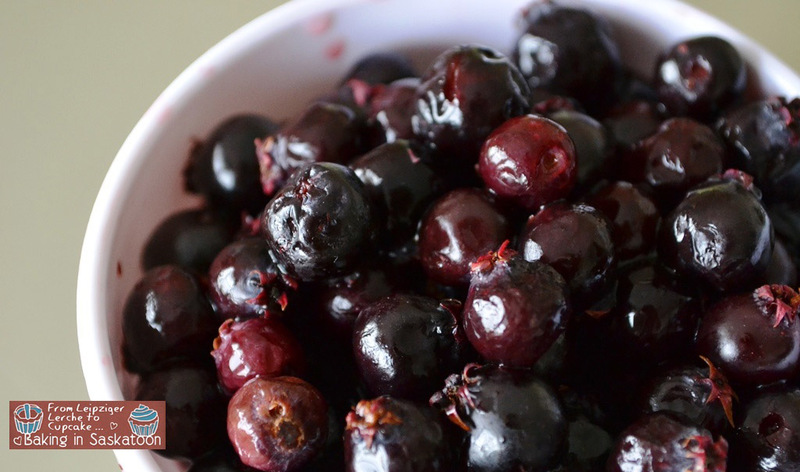 Valerie over at A Canadian Foodie lives in Alberta and she could have written about Saskatoon berries as well. I think they even grow somewhat in the United States. As a foreigner these berries are peculiar to me because it is a local plant and nothing in Germany is comparable. Although I always kind of compare them to blueberries, which is completely wrong. 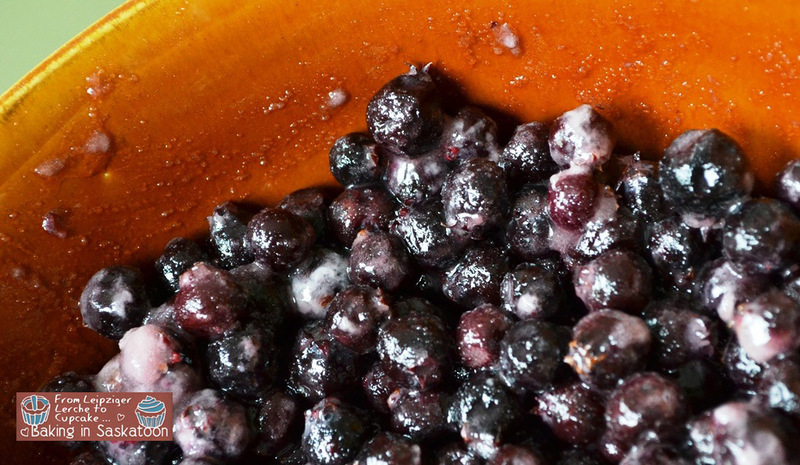 Saskatoon berries are not a berry, they are actually related to the pear. They grown on trees, not bushes. 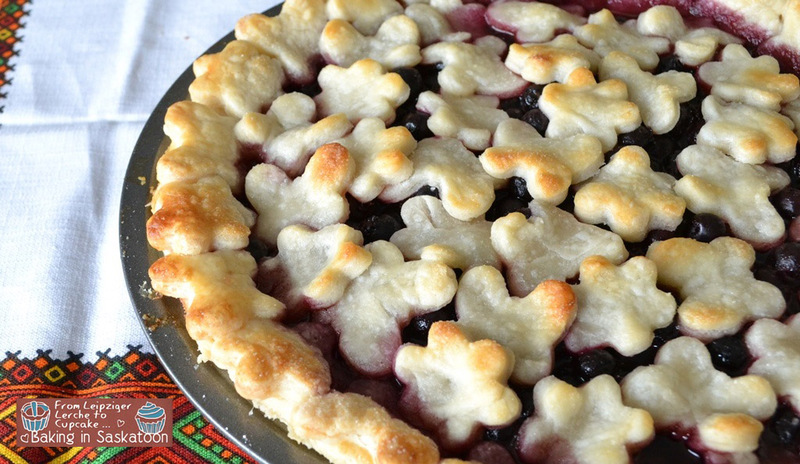 Saskatoon berries can be used for pretty much anything. There are chocolates, teas, even beef jerky flavoured with the berry, of course jams and pies. Personally, I find the berry rather bland when eaten by itself, and jams from the store tend to be too sweet. Nevertheless, it’s a big thing here and so this is what I picked. 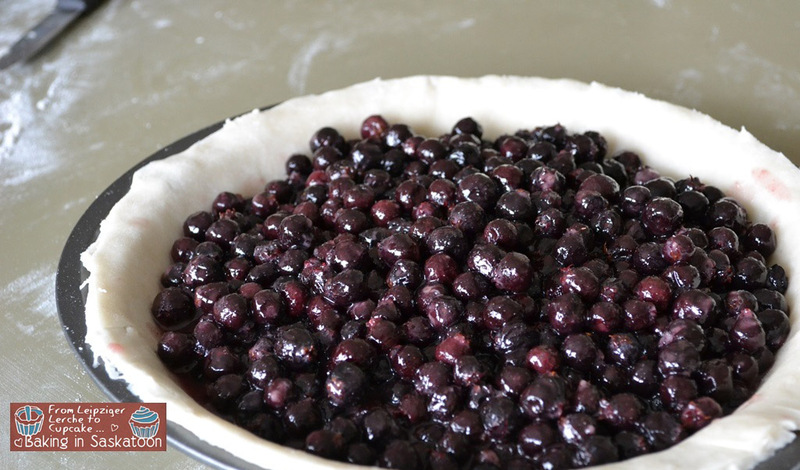 Since we were invited to a BBQ I decided to make a Saskatoon Berry Pie to bring for dessert. With a bit of whipping cream it’s a lovely dessert. Sift the flour and salt together into a bowl, then add the preferably cold shortening. Use a knife and cut through the shortening, making sure it will be as small as a pea. Then sprinkle some the cold water carefully over the mixture. 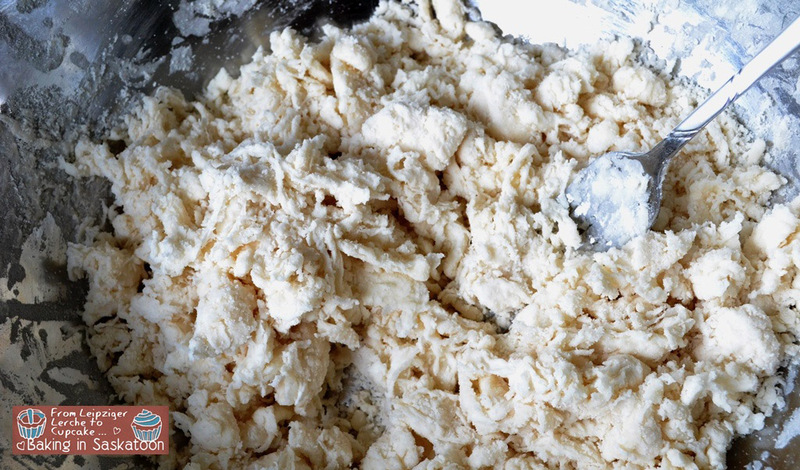 Use a fork to incorporate the water into the flour-fat mixture. Add more water until the flour is mostly wet and you have a flaky dough. Form a ball without kneading it. If you break it and it pulls instead of crumbles it is ready, otherwise add some more water. You may put the dough into the freezer until you need it. Divide the dough to make a bottom and top crust. 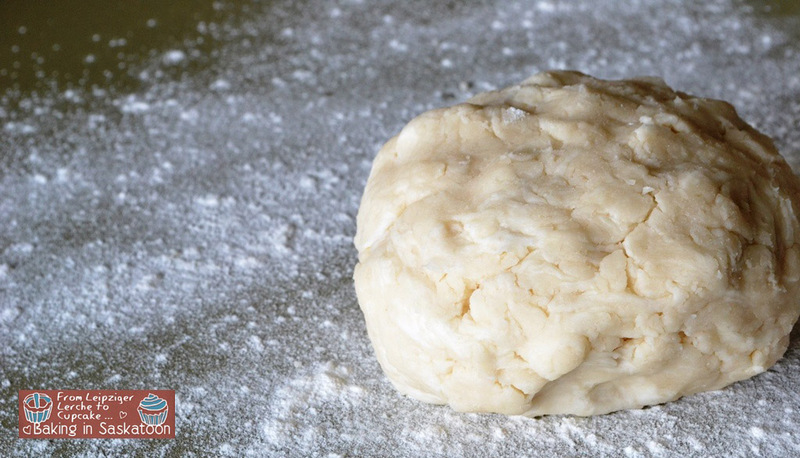 To roll out the dough, dust your working surface with flour and use a pie cloth or a clear cloth. Place the dough on the surface, dust the cloth with a bit of flour and place on the dough. Then roll out to cover your pie pan. Remember, pie crust shrinks when baked, make sure you have enough hanging over. You may bake the crust as a shell, if you do, prick it with a fork before baking. If you bake it with filling, do not prick. The top crust can be a solid one, or lattice work, or cut our shapes. I used flour and butterfly cookie cutters to cut shapes and place along the edge and on top. Make sure you wet the edge before adding the top crust so it sticks. If you use fresh berries, clean and wash them. If you use frozen ones, defrost and drain extra liquid. Then combine the berries with flour, sugar and cinnamon. 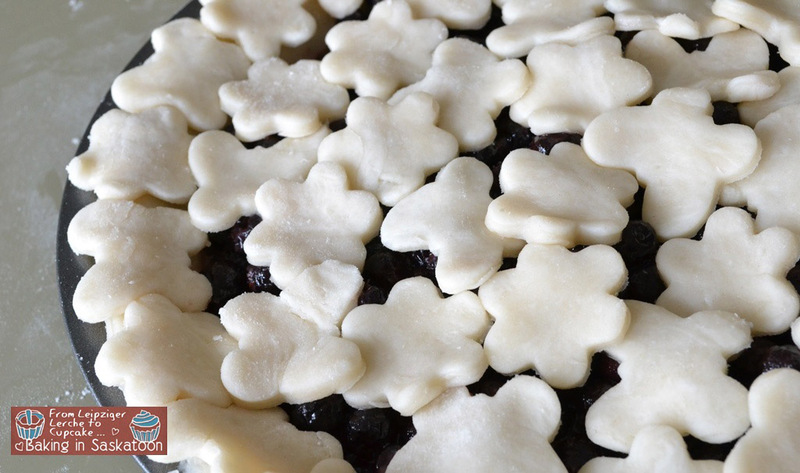 Fill the pie crust with the mixtures and add flakes of butter. The top off with a tip crust. Wash the top with egg or milk wash and sprinkle some sugar for a sparkling look. Bake at 180°C for 30 min or until light brown. 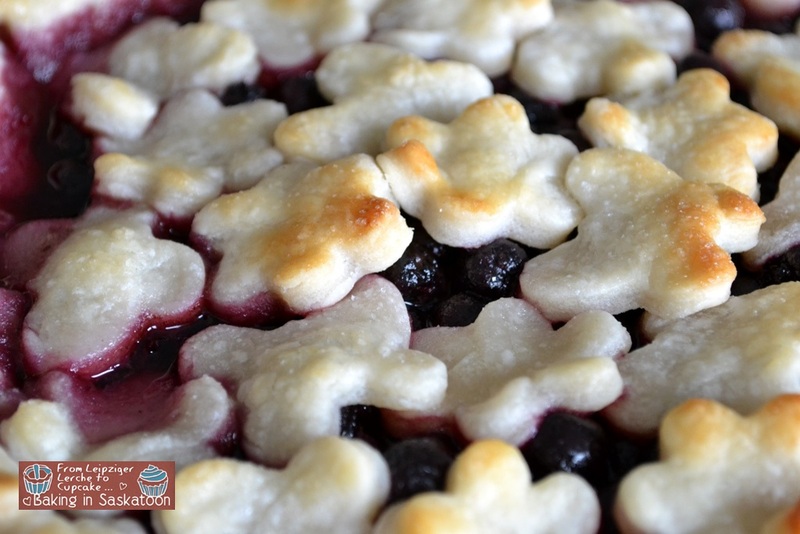 Remove from the oven and let the pie cool for 30 min before serving with whipping cream or ice cream. What is a local food, drink or dish where you are? How local is local in your books? It is interesting, isn’t it, that the Saskatoon is actually not a berry but a pome, like the apple and the pear. And you are right, it tastes nothing like the blueberry. Interestingly, they only grow in the US and in various locations in Europe now, due to exporting the plant. They are native to the Canadian prairies. 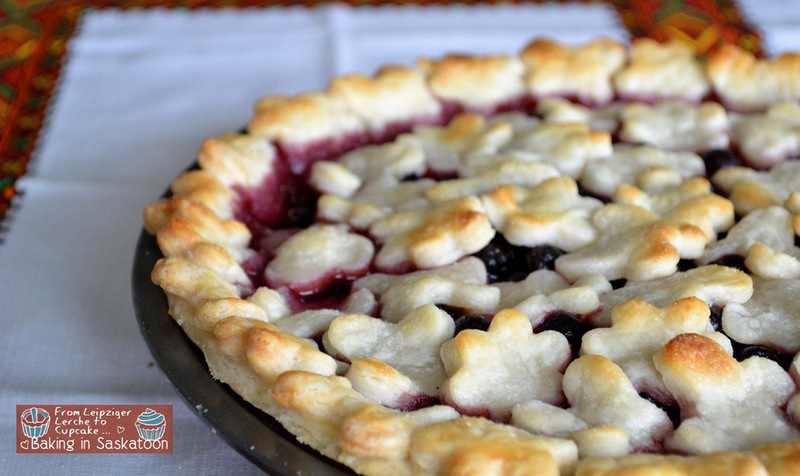 Your pie is stunning. I love the pretty top crust and am convinced your BBQ friends were delighted! I ate the first ripe berries off my tree today! Oh – I meant to comment on your regional question – provincial cannot be regional, really – our provinces are just too big – yet, for the Saskatoon berry, it can be, as they grow throughout the entire province. However, somethings do not… as you will find there is one gal sharing a recipe I have never heard of that is very popular in South Western Saskatchewan. I guess you would have to live in the area to know about it… which is what I enjoy so much about this project. One cannot travel all over Europe to taste everything “famous”… nor can one travel everywhere in Canada… but, isn’t it great to begin to learn where to go to taste these specialty foods? Saskatoon berried even grown here in British Columbia as well. I am quite sure I missed them again for this year.